Chekumuki Science Sambaralu 2016, School, District and State Level Chekumuki Science Test 2016, Jana Vignana Vedika Science Programmes, Chekumuki Tests, Chekumuki Science Test Schedule, Theme of Test and more details provided here. JVV School, District and State Level Chekumuki Science Test 2017 in Telangana: Chekumuki Science Sambaralu: Science we can't imagine our life with out this. In such a way, we are bounded with Science. In day to day development of our world science plays a vital role. With out science, there are no inventions and with out inventions, there is no development either it is economically or Medically. If we observe, even today many are leaving their lives due to superstitions which are deeply involved in the country people/ villagers. To demolish such superstitions we have to educate them and make involve in some science programmes that which plays dual role like to make them educate and they make their surrounding people to educate like family member. d. State Level on 11 & 12/11/2017. To develop, to create interest among science to know reasoning for every action of science in children. Many organizations are taking part like Jana Vignana Vedika. From past 20 years onward Chekumuki Tests have been organized by JVV among the children. It is the programme to create the interest on science and make them participate actively. The JVV has been organizing various programmes to the Educational Institutions to improve the education standards of the standards of the students. In this programme the lakhs of students are participating actively.This programme is being attracted by not only the students but also the parents, school managements and intellectuals. Jana Vignana Vedika (JVV), a voluntary science organization has been working for the past 28 years in our state to inculcate scientific temper among the masses in general and particularly among the students. JVV has district units in all districts of the state as well as mandal and town units, through which activities of science popularization spreads throughout the state. With a membership of thousands of people, comprising various walks of life like Scientists, Professors, Doctors, Engineers, Lecturers, Teachers, Businessmen, Youth, College Students,etc. JVV is considered as one of the largest people's science movement organizations in India. GOI has bestowed on JVV the highest national award, National Award for Outstanding Efforts in Science Communication for the year 2005. Eminent scientists like Dr. P. M. Bhargava, Dr. D. Balasubramaniyan, Dr. Mehtab S. Bamji, Dr. Ch. Mohan Rao, etc., are the guiding spirits behind us. On the name of Vidyarth Chekumuki magazine, JVV have been conducting a massive school-based activity-Chekumuki Science Sambaralu for the past two decades. The main objective of this activity is to make science learning an easy and interesting work for both the students and the teachers. Perhaps, this is the biggest school-based activity in our state where the participation of students in lakhs is ensured. Around 5 lakh students participated from all 10 districts of Telangana in this programme last year 2015. 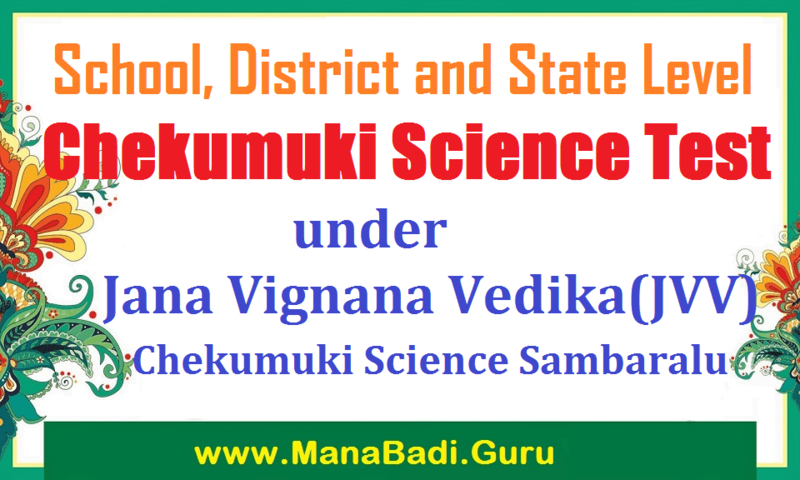 School, Mandal, District and State Level Chekumuki Science Test: Students of 8, 9,10 classes participate individually at the school level only and then onwards, a school team will be formed with the top one student of 8,9 & 10 classes and this team represents the school in all higher levels. Encouraging the team spirit among the students is the reason behind this procedure. The School and Mandal level tests will be in objective format, the District level will include Quiz round also and finally the State level test will incorporate Experiments along with Field Visit. All the questions will be based on the general science understanding of our surroundings only. The unique feature of this year test is that we have chosen the topic of Harithaharam as our theme of the test in the lines of the recent program our Telangana State Government. This is to bring your kind notice that your department has been giving support in all these years to this programme, without which we can't organize alone. Hence, JVV request you to kindly permit us this year also to organize this activity in the schools. So pleas issue the permission letter at the earliest. The JNV has issued School, District and State Level Chekumuki Science Test 2016 Notification in this regarding. The Jana Vignana Vedika, a National Award winning voluntary science organization, is actively involved, for nearly three decades, in popularization of science among masses and school children and inculcation of scientific temper among them. As you know, our organization is holding every year, a mega science event, known as "chekumuki science festival" at school, mandal, district and finally at state levels which consists of several fun science activities including quizzes and tests to promote knowledge of science among school children. This year, the school level Chekumuki Science Test will be conducted on 07-11-2017, Mandal level test on 15-11-2017, District level test on 27-11-2017 and finally, the state level festival on 11th and 12th December, 2017 at District Venue(Kothagudem). Through the proceedings of the Commissioner and Director of School Education, cited at Reference: Proceeedings Rc.No.224, Dated:26th October, 2017; the Government of Telangana have given permission to hold this Festival and informed of all the District Educational Officers accordingly. Kindly evaluate the test papers with key supplied and depute the best student in each class and to form a 3-Members School Team in each medium(Telugu and English) to participate in the next level, i.e., Mandal Level to be held at Mandal Head Quarters on 15-11-2017. Best team in each medium from both Government and Private Schools, separately at the Mandal Level, will be selected to participate in the District Level Science Test to be held on 27-11-2017 at the respective District Headquarters.